What does the country Persia (today's Iran) conjure for you? Do you think of Ayatollahs, revolutions and covered women? Not Me! For me, Persia is the exotic land of Queen Esther, the land of fabled stories such as 1001 Arabian Nights, land of golden saffron and rich flavors and textures. My view was only enhanced by cooking with my friend Sima from Shiraz and learning from her how to properly cook fluffy, snowy white Persian rice. Together, we hosted Middle eastern barbecues, shared spices, stories and child rearing. Though she has moved away to California, she left behind fragrant memories and a thirst for more Persian food. Well, if by now, you share my love of this cuisine, or just became curious after reading this - do I have the perfect book for you! Taste of Persia is Naomi Duguid detailed homage to the the regional home cooking of Persia and its complex history. On her recent visit to Cooks of Crocus Hill, I had the fortune to work with Naomi and experience first hand her passion for historical knowledge as well her dedication to the narrative of local people. Beautiful slides (her own photography) accompanied tales of her travels through the Caucasus Mountains and the whole region, her first hand experience at families' home tables, markets exploration and more. While a rapt crowd listened, with the help of Cooks' capable assistants I prepared a few recipes from Naomi's book. The lucky attendants got to start with a tangy salad of tomatoes, cucumbers and mint (seasoned with pomegranate molasses), then taste the classic delicious Pomegranate Walnut chicken over Basmati rice that was steamed with a yogurt-egg Ta'adiq (bottom of the pan). To top it all, we served them Cardamom rice pudding that was delicate, slightly sweet and aromatic with a touch of rose water. So, obviously, when I got home - Persian food was on the menu... With my own little twist Or should I say Swirl? 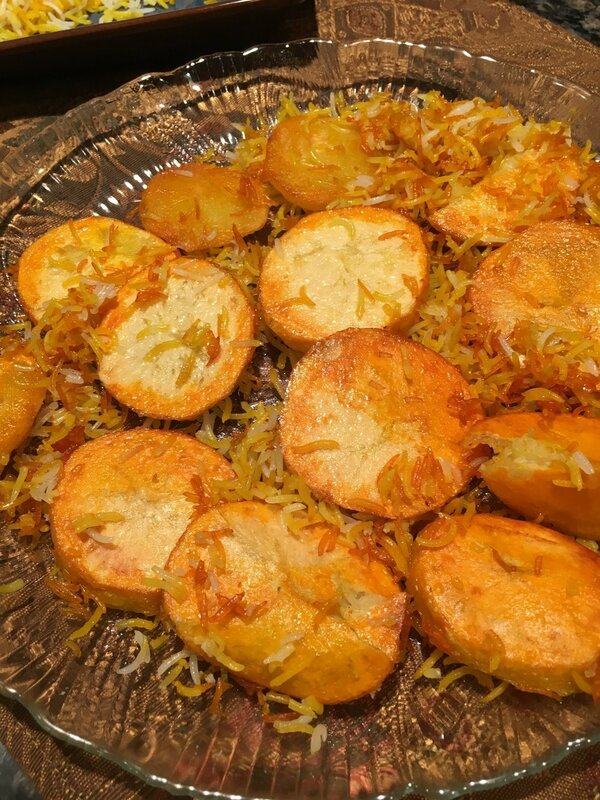 Yup, that's my Basmati rice with saffron swirl, nestled on top of a potato Ta'adiq. I think Sima would be proud!! 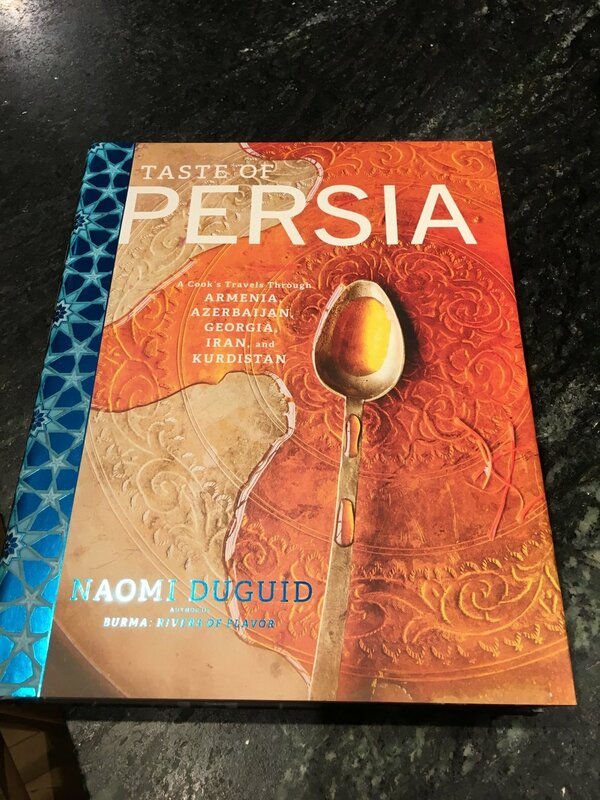 If you are salivating by now - do yourself a favor and explore the beautiful flavors of Persian cuisine... Naomi's book is a wonderful, engaging and trusty guide! Coming to think of it... I think there's a cooking class in the making here! More to come - I guess! !